Watching the White House press conference for Brazilian President Dilma Rousseff and her American counterpart Barack Obama, one couldn’t escape the vibe of camaraderie and friendship between the two leaders. It’s almost as if all the angry statements made by Rousseff and members of her government about Washington’s spying on Brasilia never happened. At one point, Rousseff tried to put a comical twist to the chilly relations between the two countries over the past two years. “Obama has told me that if he needs non-public information on Brazil he would just pick up the phone and call me,” she told reporters, laughing. But the press conference – well, the entire Rousseff trip to the US – comes after nearly two years of palatable Brazilian anger at the US for spying on the office of the presidency as well as major domestic industry. Brazil and US ties had been strained since the Brazilian Senate formed an Investigative Parliamentary Commission in September 2013 to probe reports that the US National Security Agency (NSA) spied on the Brazilian leader. Documents obtained from former NSA contractor Edward Snowden by then Guardian journalist Glenn Greenwald in August 2013 revealed that the NSA’s operation was “to improve understanding of the methods of communication and the interlocutors of the President of Brazil, Dilma Rousseff, and her top aides”. Rousseff, who was due to visit Washington in October 2013, put her trip on hold until she received an explanation from Obama. That took some time, apparently. But 16 months can be a lifetime in global politics. In January, US Vice-President Joe Biden began a diplomatic charm offensive to bring Rousseff to the White House. In March, he made an official invitation, which Rousseff accepted. Speaking at the White House on Tuesday, Rousseff said that she had received assurances from Obama and the US government that they would no longer engage in intrusive spying. 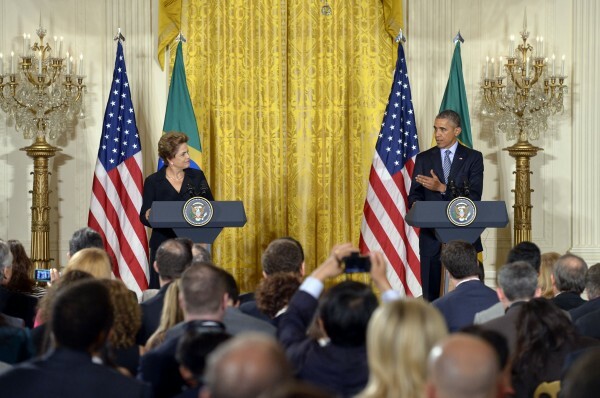 “This trip to the United States stands as a relaunch of our bilateral relations,” Rousseff added. “I will say that President Rousseff and I have had an excellent relationship since she took office. I trust her completely,” Obama responded, signaling a new chapter in ties. Two series of events prompted the US working to lure Rousseff back. The first is China’s growing clout as a major investor in Latin America. In many regional markets, China actually displaces the US as the leading business investor and source of foreign cash. Only last week, Brazil and China established a $20 billion joint fund to bolster cooperative projects in boosting production capacity in both their countries. China has signed similar projects with Brazil’s neighbors, pushing US investors to the back bench. 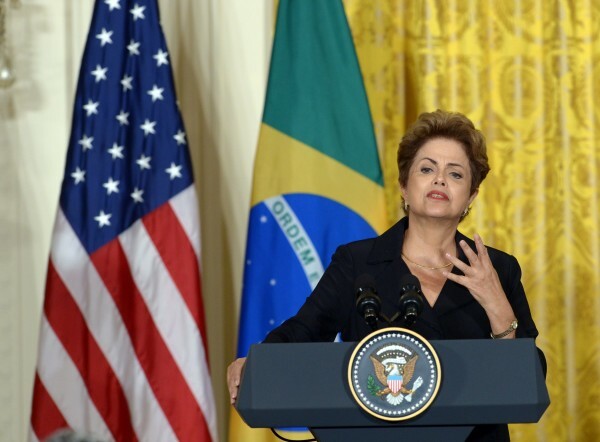 Clearly, an American-Brazil rapprochment is in Washington’s strategic interests. According to the Executive Office of the President, “Brazil was the United States’ 7th largest goods export market in 2013”. In terms of foreign direct investment (FDI), the US had directed more than $12 billion to Brazil in 2012. China, had increased its FDI in Brazil from around $100 million to more than $13 billion in 2010. The second incentive for rapprochement is that Rousseff needs to prove to her electorate that she can work with major powers to inject some much-needed energy into Brazil’s flip-flopping economy. Since the fallout with the US in September 2013, Rousseff has weathered a deluge of bad economic data. In 2013, Brazil’s GDP was expected to reach 2.13 per cent; inflation was around 5.8 per cent; interest rates were around 9.25 per cent and the trade surplus was at $6 billion. Within a year, however, the picture was drastically reversed: Industrial output, including in the automotive sector, plummeted; inflation rose to 6.3 per cent; interest rates jumped to nearly 11 per cent and economic growth was under 1 per cent. 2015 was an even worse year. Inflation is practically out of control hitting 8.47 per cent in April. Brazil’s Central Bank has struggled for years to bring it down to a healthy level of 4.5 per cent. Unemployment has gradually increased from 4.7 per cent in July 2014 to 6.7 per cent in April 2015. Interest rates were raised to over 13 per cent in April 2015. In May, Brazil’s national statistics agency IBGE said gross domestic product contracted 0.2 per cent in the first three months of the year from the previous quarter. In the same month, the Brazilian government unveiled $22.6-billion budget cuts in an attempt to thwart an investment downgrade and to rebalance the country’s economy, local media reported Friday. This came in tandem with three key bills passed by Brazil’s Congress to cut public spending and raise taxes – two issues that have incensed many in the country sparking massive street protests in major cities, including the capital. A survey of 2840 people in 174 cities by national pollster Datafolha last week found that 65 per cent of Brazilians see the government’s work as “bad” or “very bad”. Can Rousseff turn it around? She’s certainly putting a lot of stock in the now warmed ties with Washington. And she’s leaving no stone unturned. Her entourage of several dozen Brazilian business experts have held talks with the US Chamber of Commerce, including major financiers such as JP Morgan, Blackrock and Citigroup. On Wednesday, she leaves Washington for San Francisco and then meets with NASA officials, as well as visiting Google. This is not merely a visit to mend fences with Obama – it’s about marketing Brazil as a lucrative market for American businesses. She told reporters in New York on Monday that she would work to encourage international businesses to “take advantage of the business and investment opportunities that are emerging in Brazil, especially in infrastructure”. In the meantime, Rousseff can count herself as a partner with the US. On climate change, counter-terrorism, fighting poverty, the US can’t do it alone, Obama said at the White House press conference with Rousseff on Tuesday. Brazil is an “absolutely indispensable partner” in these efforts, he added. Obama went on to say that his meeting with Rousseff, who he took on tour to the Martin Luther King Jr Memorial a day earlier, paved the way for future cooperation between the two countries. “We should be very strong partners for years to come,” he said. Invest in Brasil is easy. Especially US-american companies are suffering because they never understand and accept the mentality.